For the festive costumes Schwalm women wore many skirts one upon the other. 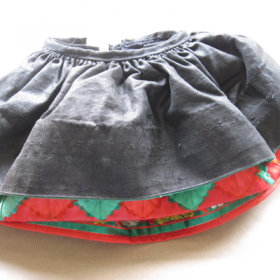 It was common that 10-12 skirts (sometimes more) belonged to one set. More than any other element, the numerous skirts gave the Schwalm costume its special appearance. For it to be possible to wear, one upon the other, so many skirts, they had to be very full. And for it to be possible to carry the weight of so many skirts, they had to be short. The picture of only three skirts gives an indication of the enormous amount of fabric 10-12 skirts would have had. Upper class women had more, and poorer women had substantially fewer skirts in their respective trousseaus. Women of modest means often owned so-called double skirts. 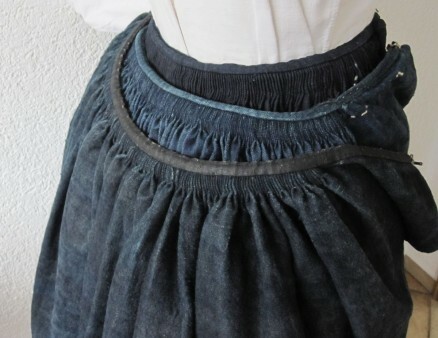 These were skirts with an additional piece of fabric (a strip about 15 cm high and trimmed with a border at the bottom) attached at the bottom edge to simulate a second skirt. Most of the skirts of one set were made from “Beiderwand”. 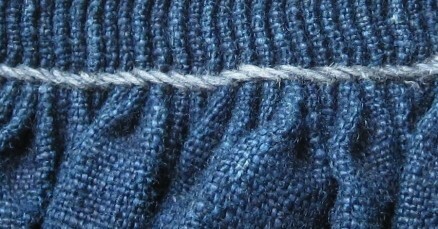 This is a linen weave fabric made of linen threads in the warp and hand-spun lambs wool in the woof. It was dyed to blue with indigo. These fabrics were not colourfast. Only the skirt worn on top was made of finer and more expensive fabric. I found different details. 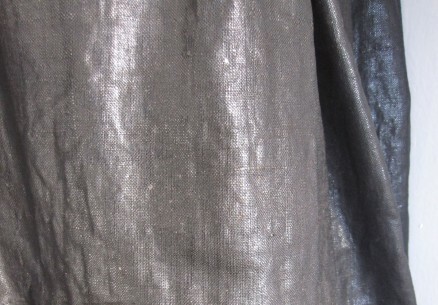 One source tells about fine, shiny black linen for the green costumes, another source tells about fine, shiny “Beiderwand” dyed to black for the green and blue costumes and dyed to blue for the red costume. A third source mentions “Tuch” (a fabric made of wool yarn). The matte “Tuch” skirts were worn in mourning and to the Lord´s Supper. 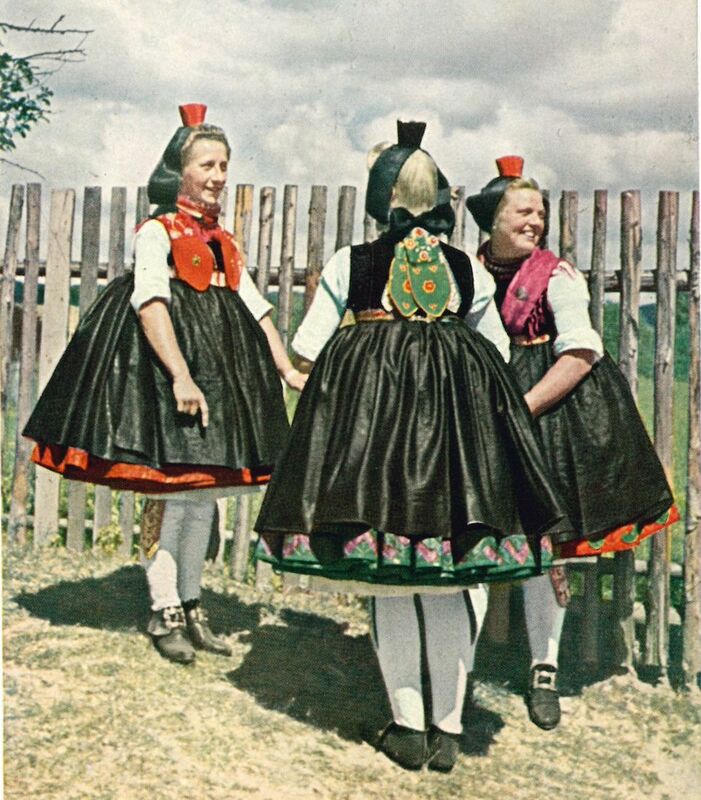 The shiny skirts were worn for celebrations such as “Kirmes” (village fairs) or weddings. The shiny skirts, susceptible to water spots, were not worn during rainy weather. Also it is reported that the black and shiny top skirts were worn only on kermis Saturdays and during wedding parties only up to the afternoon refreshments. “Beiderwand” and linen fabric were brought to a shine by dipping them into a special mixture made of a glue from skin leftovers from the tanners and potash. 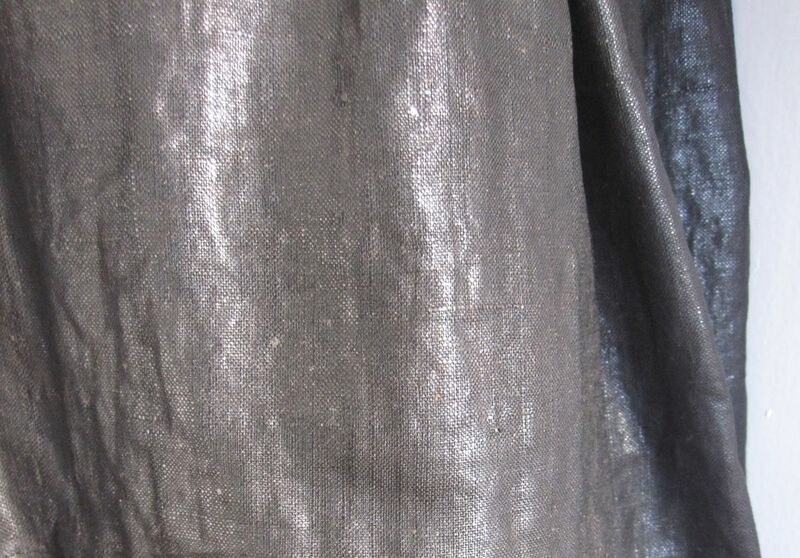 By dipping into this mixture, the fabric got both a shine and a stiffness. The shine was increased by rubbing with a special stone, the “Glänzstein”. Therefore the fabric was laid on a corrugated table and rubbed with very strong pressure. The “Glänzstein” was made of a wooden handle with an oval shaped fine-grained agate stone attached to the bottom. In winter women wore the “Kalmuck” skirt closest to the body. 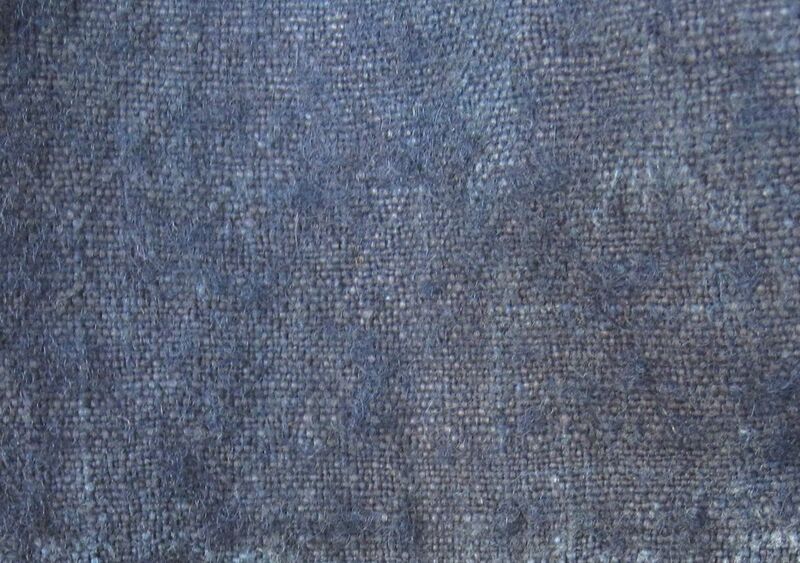 “Kalmuck” was a twill fabric that had been vigorously rubbed on both sides. 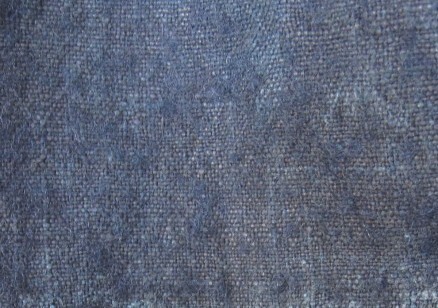 This treatment produced a soft and warm fabric. 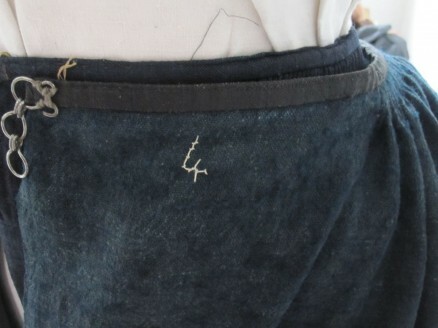 The waistband was fastened in the middle of the front (this area was covered with an apron later). To the left and to the right of the middle front, sections of the fabric remained plain, the rest was gathered. To achieve an even drape, the following was done: The waist was measured and a fabric strip for the waistband was divided into 6 parts. However the width of the skirt fabric was divided into 8 parts. A skirt has a finished waist measurement of 66 cm. So, making the skirt, 11 cm of the fabric remain plain (1 part), 44 cm (4 parts) would have been gathered, and the last 11 cm (1 part) remains plain again. The four parts for gathering were divided in half again, so that 8 parts of 5.5 cm each were established. The width of the skirt fabric measured 382 cm. For the two plain parts 22 cm were needed. So 360 cm of fabric remained. This was divided into 8 parts of 45 cm each. The fabric had to be divided in this way so that in the end 45 cm of fabric was gathered down to 5.5 cm. If this division had not been made, it would be near impossible to space the gathers evenly onto the waistband. The tiny pleats were laid and pinned. 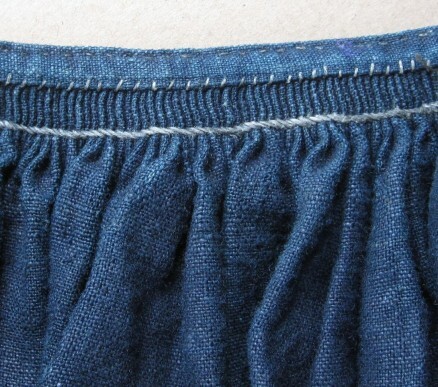 If everything fit according to the previously made divisions, the pleats were secured with Stem stitches using a thick and strong thread, from the back and about 2-3 cm from the top edge. 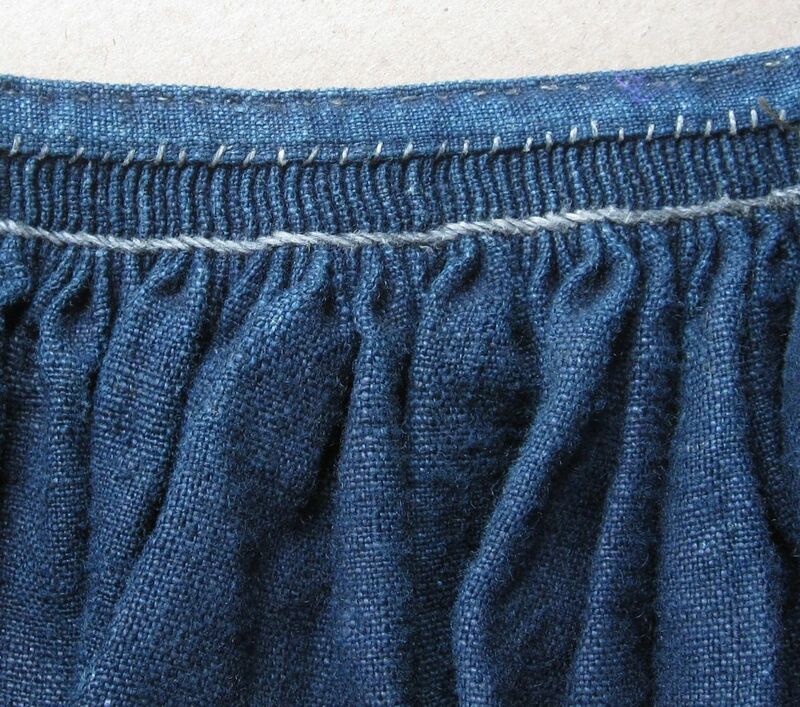 Along the top edge, a fabric strip for the waistband was laid right sides together and sewn. It was then turned and secured on the backside approximately in the middle of the pleats. 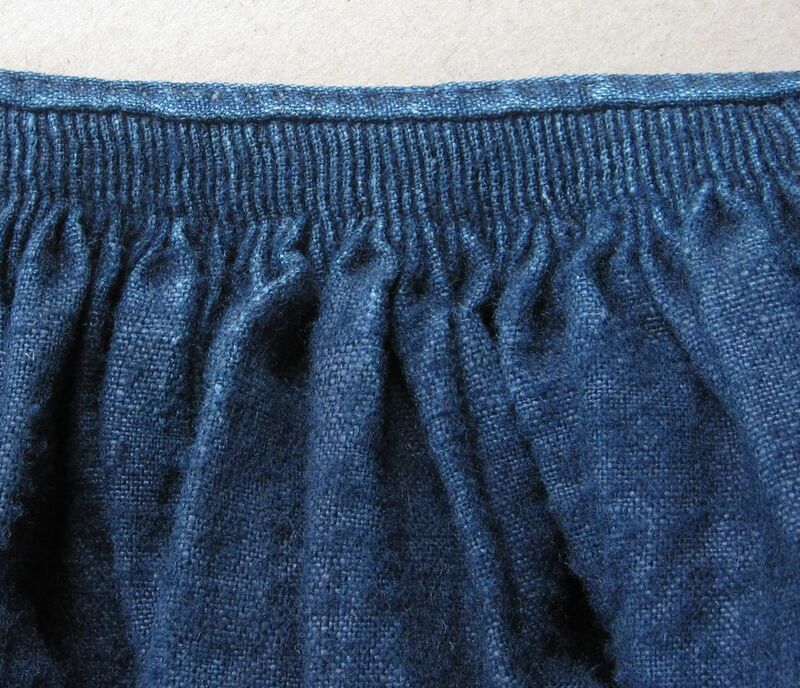 In this way the pleats were stabilized once more, and a waistband is attached. Because adding skirt upon skirt increased the waist measurement by 2-3 cm per skirt, each skirt´s waist had to be increased accordingly. 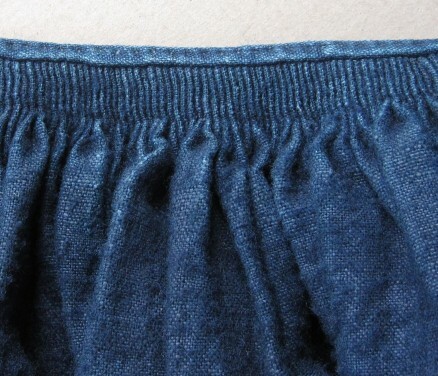 The skirt was sewn closed along the center front seam about half way up from the hem. And the waist was closed with hook and eye. If, later on, there was need to increase the waists, there had to be a way to adjust the waistband. 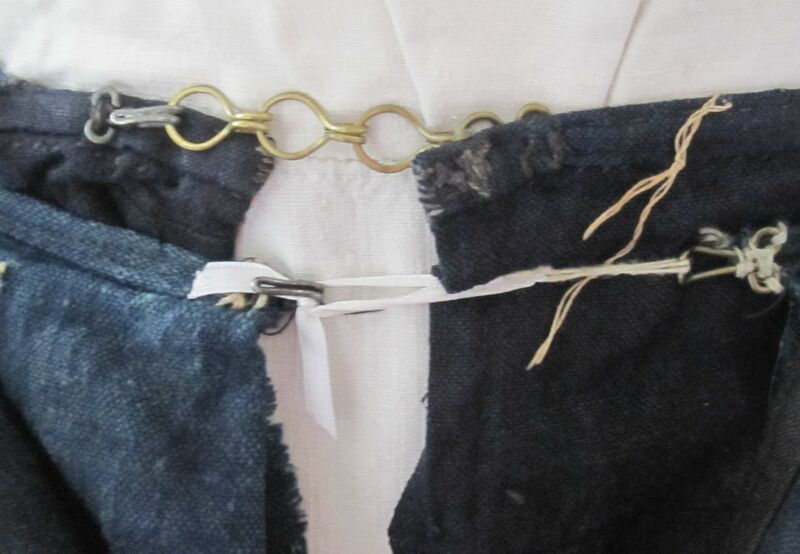 The women solved this problem by adding small chains or bands to bridge the gaps. The length of the skirts differed. It was not only determined by the height of the woman, but also on the range the skirt would have – that is, how far they would lie up and away from the body. The bottom skirt would have been short enough so that the undershirt could be seen peeking from underneath about a hands width. Every additional skirt must be cut somewhat longer (although in the end it would look as though it is shorter). Only in a few villages of the Schwalm, were the skirts’ lengths cut so that all – one upon the other – looked the same length. Usually the upper skirt fell a little above the hem of the previous skirt so that the whole magnificence of the bands could be seen. To eliminate confusion when dressing, the skirts were numbered. It would be difficult, to establish a nice drape by hemming such sturdy fabric. So at the bottom edges the skirts were trimmed with narrow strips of fine coton fabric and often decorated with additional borders. The skirt bands are worth their own chapter, so I will report about this subject in the future. herzlichen Dank für deine ausführliche Beschreibung der Schwalmerröcke! 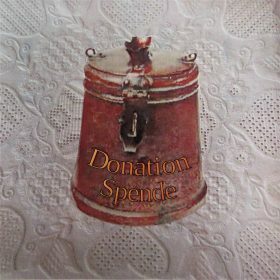 Und dann die Kettchen für wenn man etwas zugenommen hatte. Dass ist wohl von allen Zeiten :).